Even for a techno-shaman, a kachina in the bedroom isn't exactly part of the drill. When Olivia Lawson wakes to find one towering over her, she panics. A Hopi god visiting the real world isn't just wrong - it's impossible. Or is it? Soon Olivia learns that the kachina is the least of her worries. 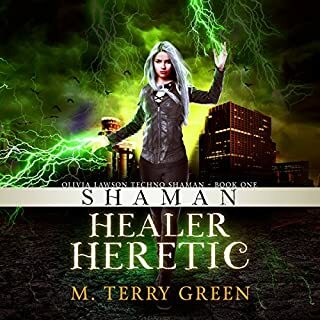 As she struggles to save her clients, clashes with other shamans, and fends off the attacks of real-world vigilantes, Olivia finds herself in the destructive path of a malevolent ancient force intent on leaving the spiritual realm to conquer this one. The perfect reading of a terrifc book! What did you love best about Shaman, Healer, Heretic? Shaman, Healer, Heretic is the first book in a series blending the ancient technology of shamanism with the modern technology of cyberspace. Olivia - Livvy - Lawson is of course my favorite character. She is the titular techno-shaman, and crux of the ongoing tale. Both her voice and her reading are perfect for the book. I look forward to the next volumes! Listen to this Audible volume, then buy the books so you know what's coming!